The Night was still hot,still well into the 27 degrees Celsius range,the humidity around the upper 50s at least. A particular alley way near the eage of the blood clan border had a dark disgusting scent emerging from it. The stench of fresh blood being spilled on filthy pavement tore though any cat with a functioning nostril. If the smell wasn’t enough to get ones attention that something very dark occurring in the rouge lands,then the screams and yowls of a colony being massacred would have been their second clue. For any sane cat,the better option would to be to stay put and check in the morning. For who could really guess what’s going on in the distant darkness. It could be a pack of dogs or a few unhinged humans taking their frustrations out on the poor sods that lives their. But this was right by the ruthless blood clan and if you can be sure of one thing,atleast one blood clanner would have the the nerve to see what was going on. For those brave enough who ventured forth into this dark gory abyss,the sight was truly horrific. Rouge corpses littered the ground,their bodies mangled with claw and bite marks,their necks all deliberately slashed to let the crimson liquid of their bodies flow out onto the street. The bloody paw prints of the assailants covering the ground and walls of the alley way. The carnage ended at a dead end,where the lone surviving culprit of the massacre could be heard digging into the corpse of the leader of the rouges. This monster sensed your eyes upon it and looked up from its kill,it’s two glowing green eyes piercing though the darkness as if staring into your soul. marlowe had been dying to find a time to explore and get out of the damn house with no one noticing her. she wasn't appreciative of efforts to go with her. she wanted to go alone. night seemed to be the obvious time to depart to marlowe. plus, she had heard some strange sounds she wanted to investigate. as soon as the blue kitten stepped out the front door, she immediately regretted her decision. an awful, putrid scent hit her nostrils, causing her to recoil in disgust. what in the world was going on? Marlowe seemed to stand like a rabbit in the midst of a circle of wolves, and Canary instinctively trotted up beside her, and then further into the abyss, glare of a single optic burning back into a pair of emerald eyes, whom to Canary was almost unrecognizable amongst the carnage. Perhaps two rabbits were better than one. Guessing by the scent and the caramel tom's lack of memory regarding the pelts and faces of the maimed carcasses, Canary assumed that the victims were all rogues. Nothing of note, then. Still, such barbarous butchery was definitely subject to intrigue from any BloodClanner. As much as Canary did not wish for Marlowe to lay eyes on such a thing, he deemed becoming accustomed to sights like this necessary for a future in the city. At the very least, this cat had wiped out potential trespassers, though it made such a callous mess. His stomach and throat were a little strained, but his voice was dull and desensitized. "What is your name," the boy's voice shook, "and what do you want?" The eyes gleamered in the darkness,peering at the two young alive cats that were brave enough to come witness his carnage. One bloody foot emerged from the darkness,illuminated by the full moon before a sleek black face of the tom emerged. 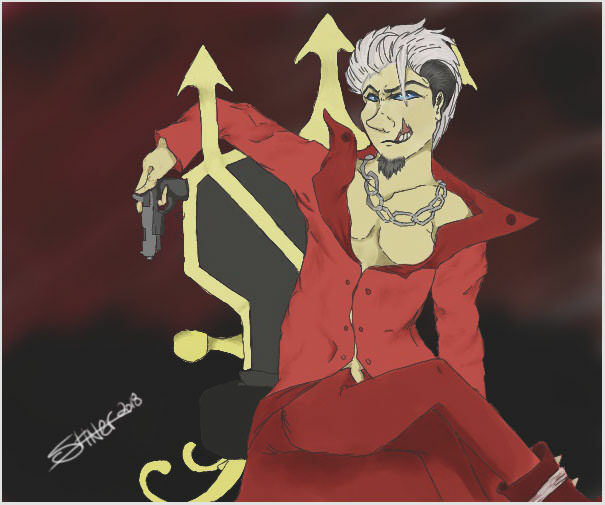 His eyes wild and a wicked inside smirk across his face,as if staring down his next prey items. 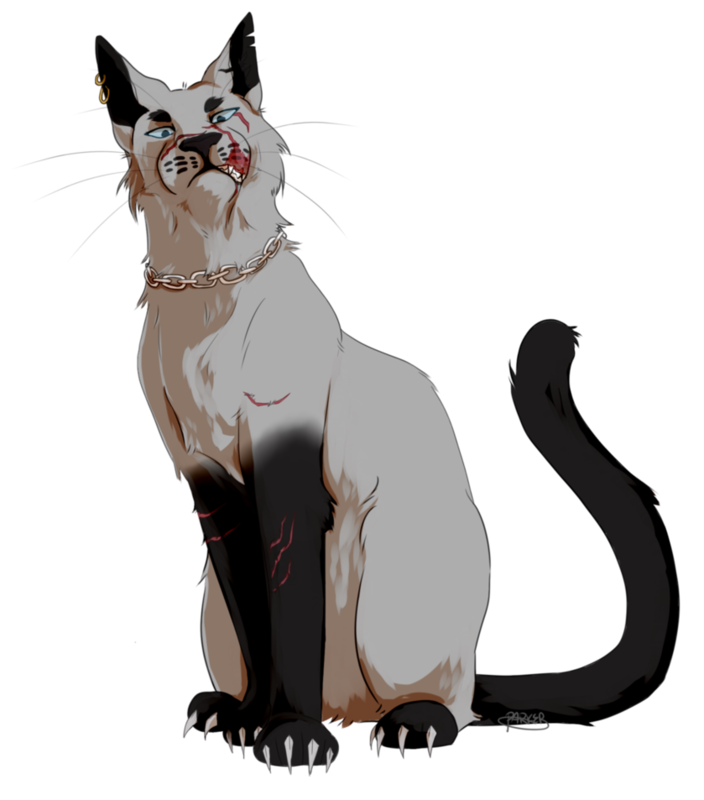 His bloody fur bristled with adrenaline as he slowly let his body come from the darkness,his entire frame either covered in blood or held a past scar. The aura around him was so great that one would think the darkforest had manifested itself into the world of the living. “KHORNE!” He answered for the name that the tom asked for.”And I Desire Blood,Carnage,and battle “ he proclaimed as he panted for breath. His eyes fixed on the two toms,as if judging if it was worth the time to add their bodies to his kill count for the night. slinking within the shadows, guided by the caterwauling, The scent of his children laying a foundation of anxiety within his every step. His bones and bulging muscles rippling beneath his tattered pelt , illuminated by the night sky. Sucking in every scent as he ascended from the pavement to the top of a dumpster. His hip popping, sending a shooting pain throughout his body. However, it did nothing to his spirit, for his legs only worked faster. Bringing him through the labyrinth of fire-escapes and balcony roofs. Eventually pausing to turn down the darkest street that secreted the familiar stench of a massacre. Irony claws digging into the walls of his nostrils, bringing him to lick his lips. Oceanic hues laid across the carnage in bewilderment, his brows furrowing as he crawled down from the rafters. His paws meeting the ground with a subtl thump. Callous-covered pads tapping against the pavement as he advanced from behind his children. Coming up to stand between yet behind them still. His eyes meeting with emeralds, his gaze falling over the stranger's flank and paws, coated in blood as it were. "don't we all" he spoke up, said in the manner of a question but with every intention to be a statement, voice raspy with lack of use. Running his tongue over his exposed gum, he sidestepped from behind marlowe and padded forward protectively. "You take down this colony by yourself?" Caledon narrowed his eyes, studying the tom. Caledon [kal-i-duh n] aka. "Smiley"
"If the world offers you nothing, take the world". ⌲ Turkish van with half of his lip missing. multiple scars, and dark-blue eyes. ⌲ very difficult | weakness - blows to the face or exposed gum.
" THEY CALL ME THE DEVIL, SO I MADE THIS WORLD MY HELL." biography + artistic reference + voice / accent + aesthetic board + human au art.